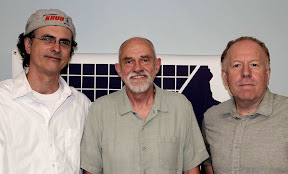 This week Dream Green spotlights green policy with featured guests David Osterberg, founder and executive director of the Iowa Policy Project, and John Collins, associate chair of MUM's Sustainable Living Department. Policy has played, and continues to play, a critical role in the growth of the green sector. Learn how Iowa became the first state in the U.S. to pass legislation promoting the use of renewable resources and about other alternatives that have worked elsewhere. John Collins’ career began in the Hong Kong government, writing policy in the fields of marine, agriculture, fisheries, and United Nations. He then founded/directed a development and construction company that built houses, apartments, and community office buildings which included many eco features — such as high-spec insulation, passive solar, and rammed earth. Collins was also engaged in politics and national campaigning on GMOs and waste management issues and served as an elected local councilor in the U.K.
Collins joined MUM’s Sustainable Living faculty in 2008 and has developed a range of courses related to state, national, and international policy and governance to address sustainability issues. He has a joint honors degree from Bristol University, England, in Philosophy and Economics. NEXT WEEK: The Dream Green series presents a focus on the University of Iowa with Liz Christiansen, director of the Office of Sustainability and Darice Baxter, environmental specialist, as well as walking tours of the Sustainable Energy Discovery District, the UI Power Plant, and the student gardens.